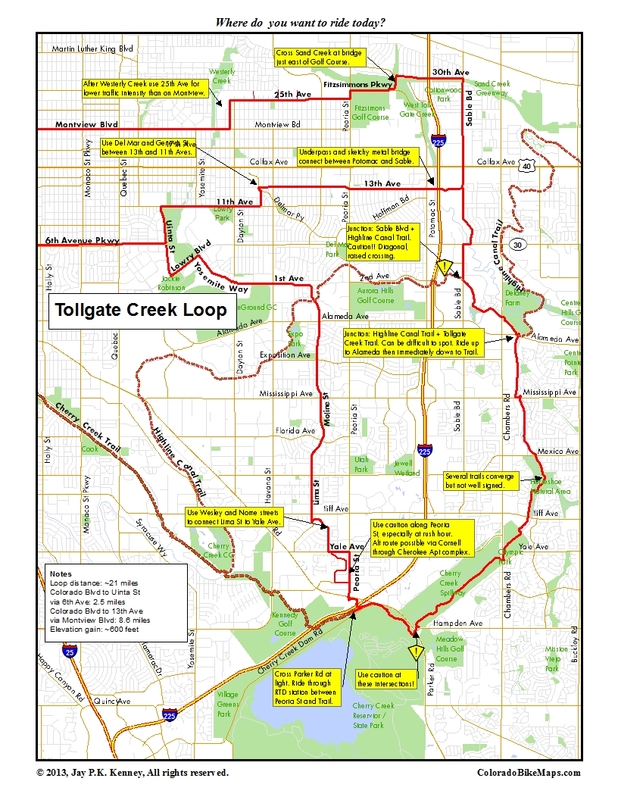 Tollgate Creek is the major tributary of Sand Creek and drains (or at least used to before Cherry Creek and Aurora Reservoirs were built) the eastern plains between the two reservoirs. As close as it is to most urban cyclists, it sees little bicycle traffic. 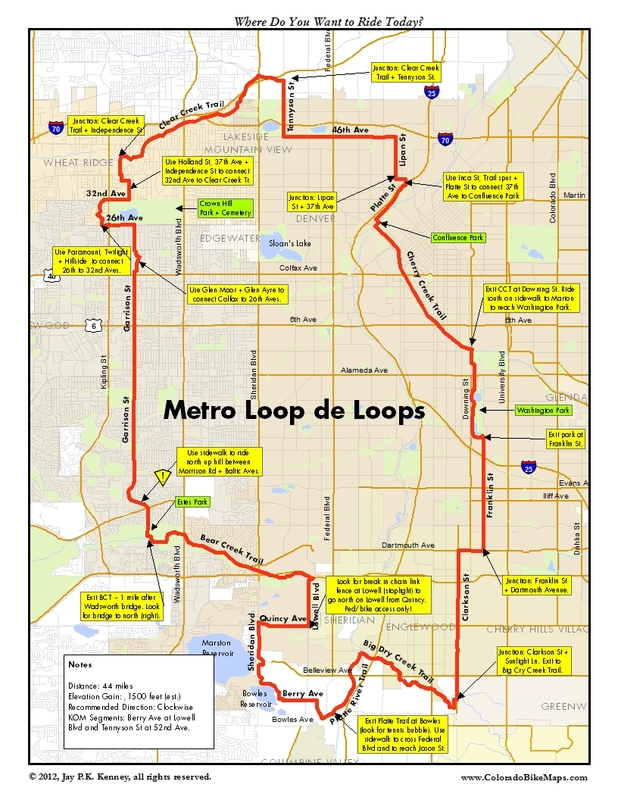 If the lack of use reflects uncertainty about how to link it up to make a loop, this map will help. 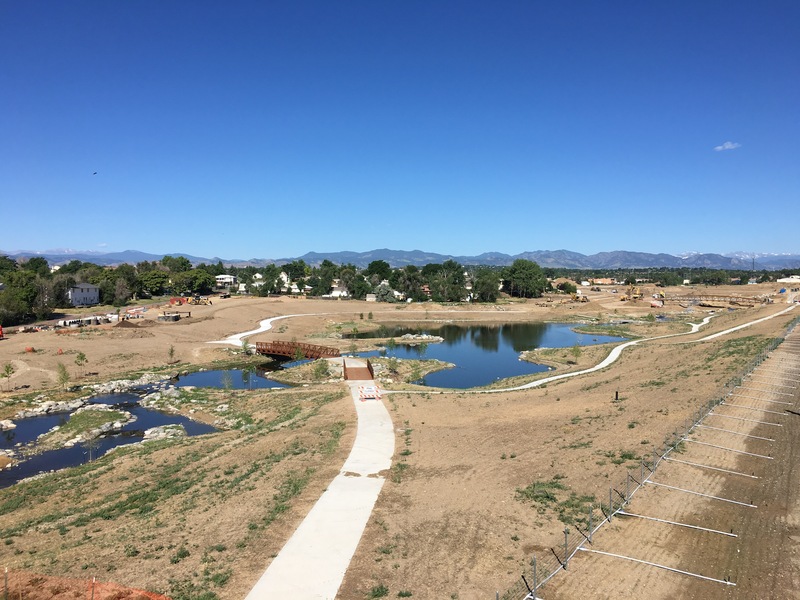 The trail proper runs from the historic Delaney Farm in Aurora south to Iliff Ave. A branch of the trail heads southeast at Horseshoe Park and winds down to Quincy Ave with an optional tour on the Highline Canal further south to the Aurora Reservoir. 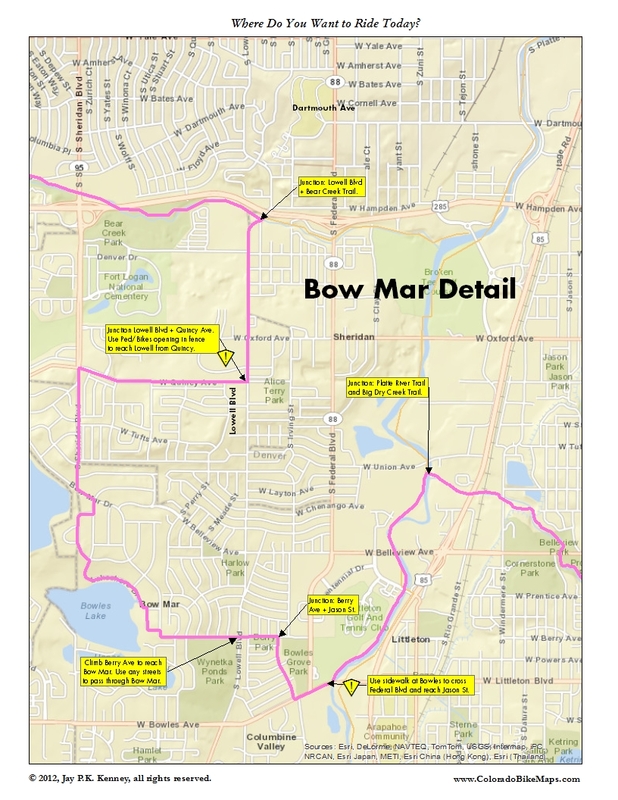 The route shown here is Denver-centric and takes advantage of Montview Blvd and the little-used but very quiet 25th Ave to reach Fitzsimmons Parkway. 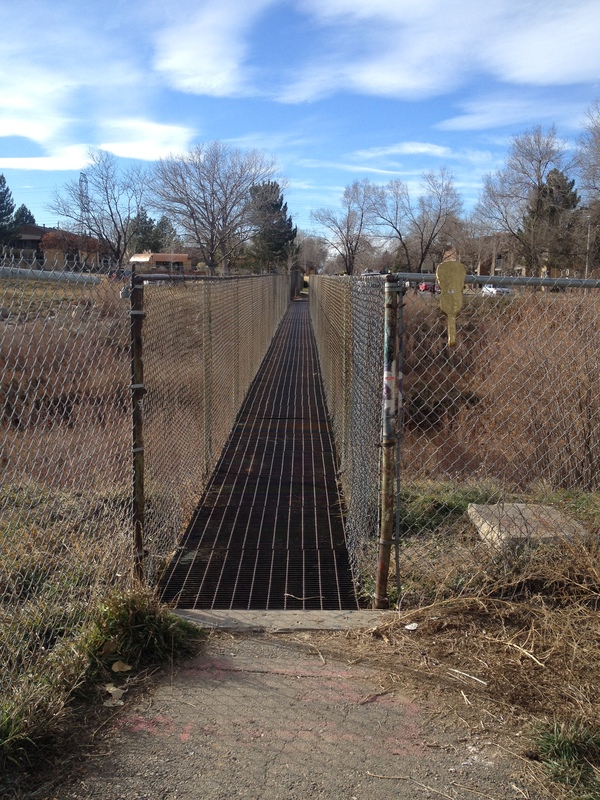 A bridge across Sand Creek spills you out on 30th Ave and then to Sable Blvd. 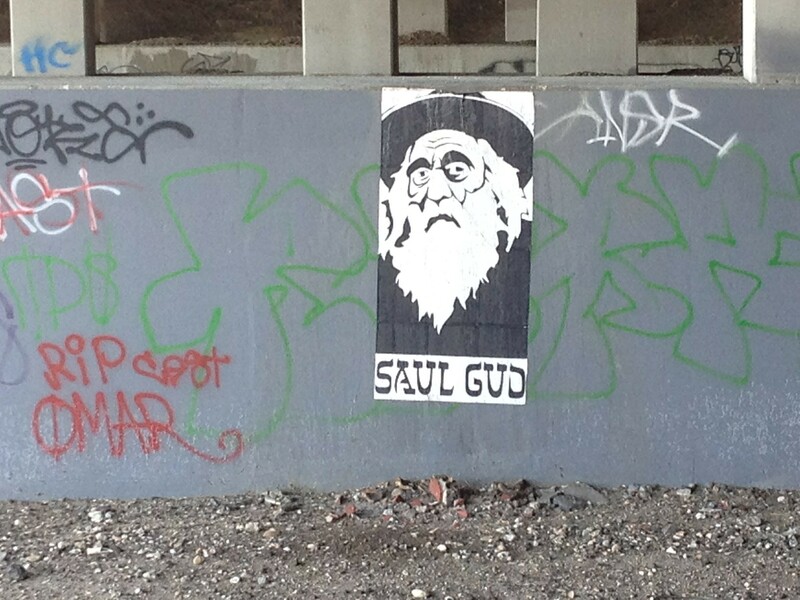 Sable Blvd will carry you south to the junction with the Highline Canal (apprximately 2nd Ave). Sable Blvd between 30th Ave and the Highline Canal offers very good on-street cycling. There’s a jog at 6th Ave and a left turn back onto Sable, but it’s entirely manageable if you make the turn from the right (north) turn-lane of two. 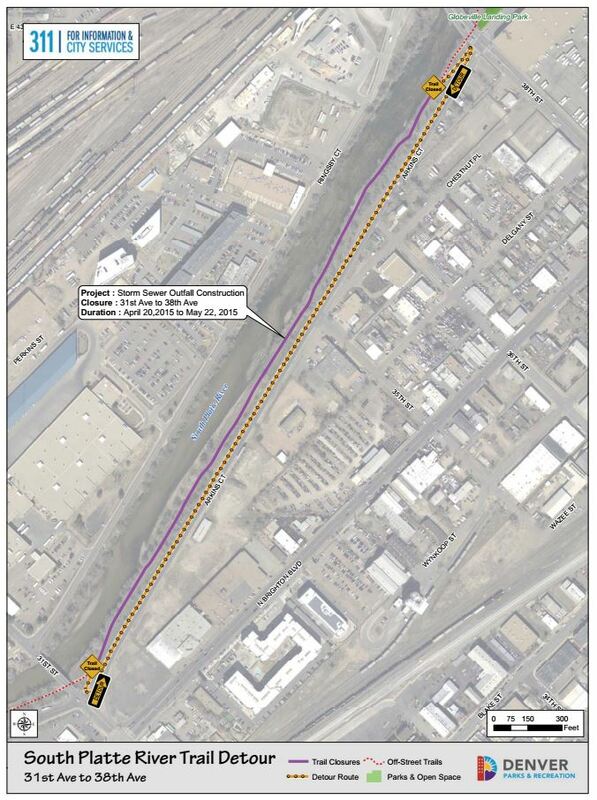 The intersection with, and turn onto, the Highline Canal Trail is not so friendly. First, a very narrow bike lane carries you up a hill to where the trail crosses Sable. Second, the concrete median has a diagonal cut in it for cyclists but it’s a hump, it’s narrow, and not easily accessible if there’s traffic behind you. Third, there’s no turn lane. So if you’re feeling pinched by traffic your first time through, stop to the right, in the bike lane. Wait for traffic to clear behind you and roll into the median slowly while you gauge the flow of northbound traffic. Once across you’re on a great stretch of the Highline Trail. 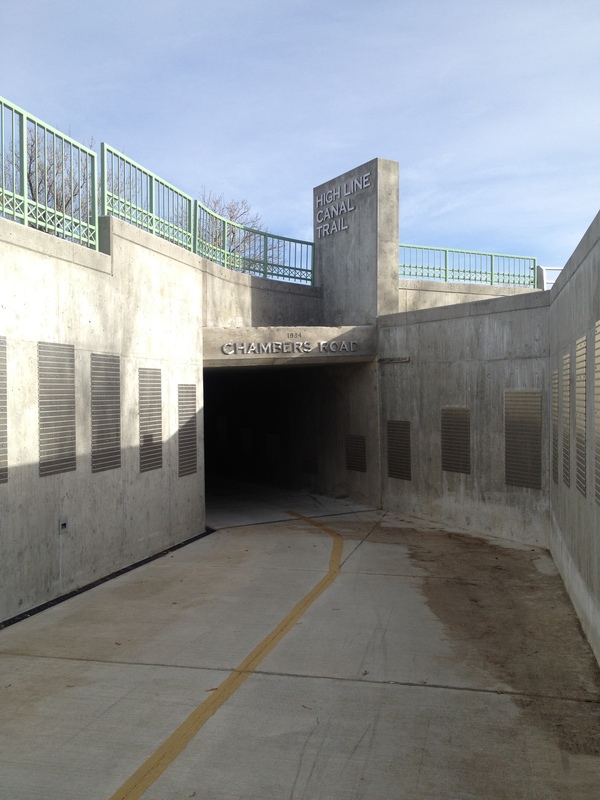 It winds along the canal, passes by the Aurora city center and joins the Tollgate Trail at Alameda Ave. Exit right and up then immediately down to access Tollgate Trail. 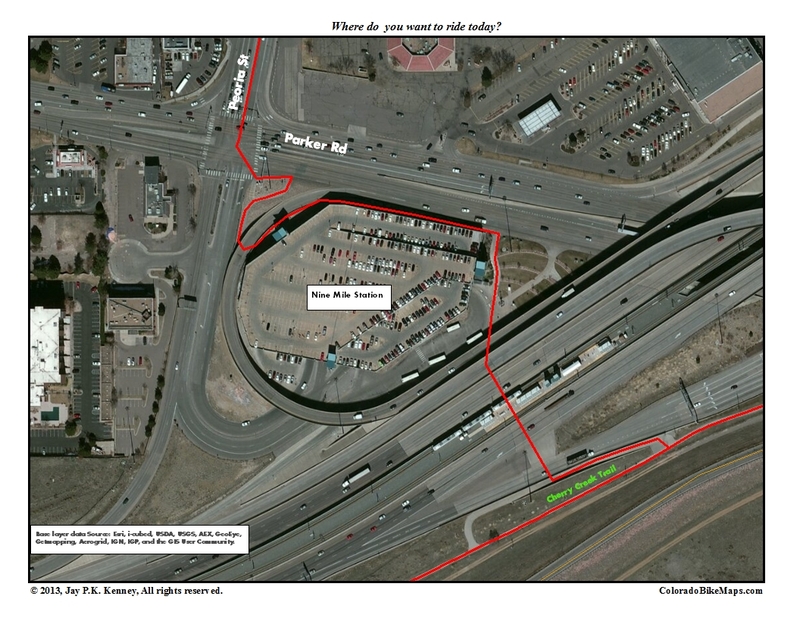 I’m always a little confused here because you leave a smooth gray concrete trail and connect to Tollgate on a rough, dusty looking stretch of pavement that hardly looks like a trail at all. Go south from here to smooth sailing on Tollgate Trail. 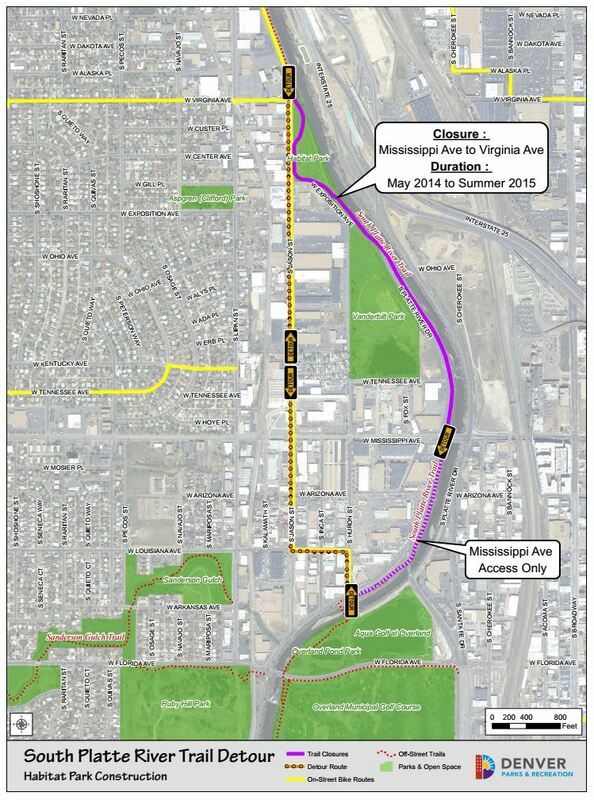 At Mississippi Ave you surface, go east, then drop down again to creek level. 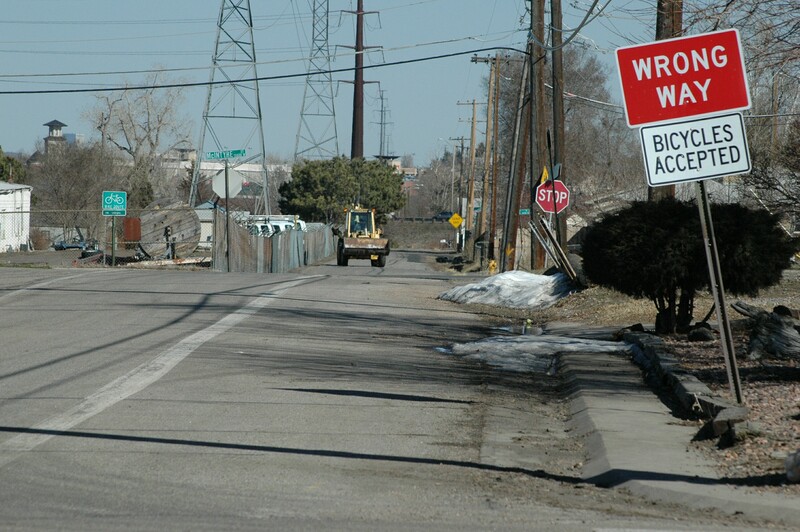 At Mexico and Iliff Ave negotiate at-grade crossings with traffic lights. 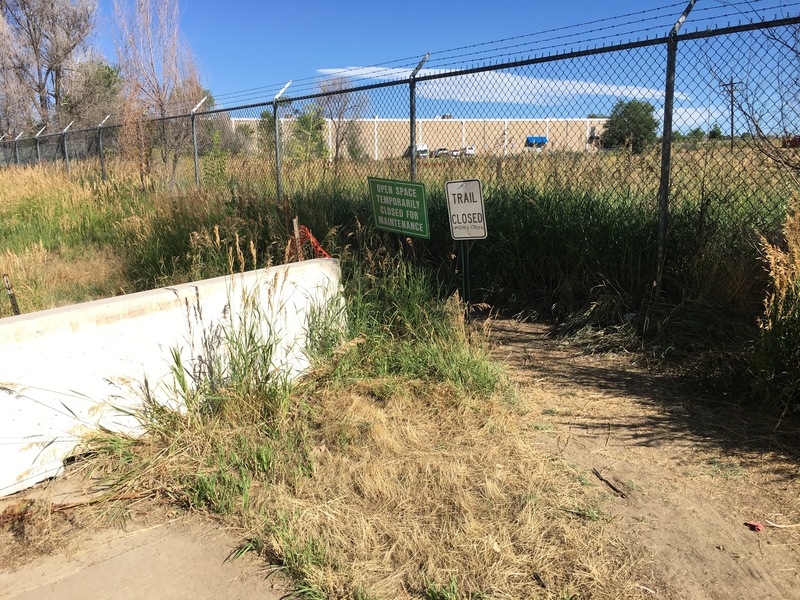 You’ll approach a triple trail junction just before Iliff. There’s little signage but the baseball field at Horseshoe Park will be your sign to turn west to cross the creek and then head south. 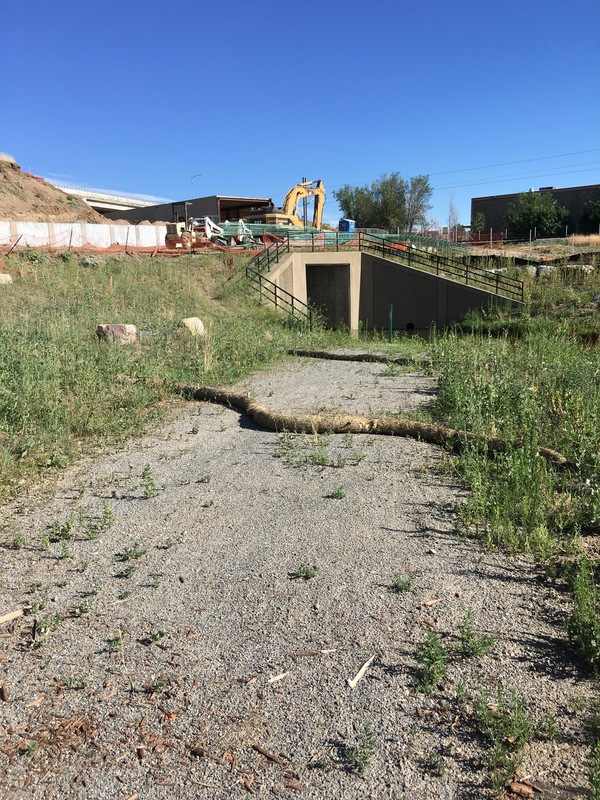 Follow the trail south through the sprawling Wheel and Olympic Parks to reach the Cherry Creek Reservoir Spillway Trail. Fine riding continues. Cross Chambers Rd at the light. Ride south. Just before reaching the reservoir be wary of high speed traffic at the Parker Rd and Hampden Ave interchange. There are traffic lights at both crossings and they are essential at rush hour. 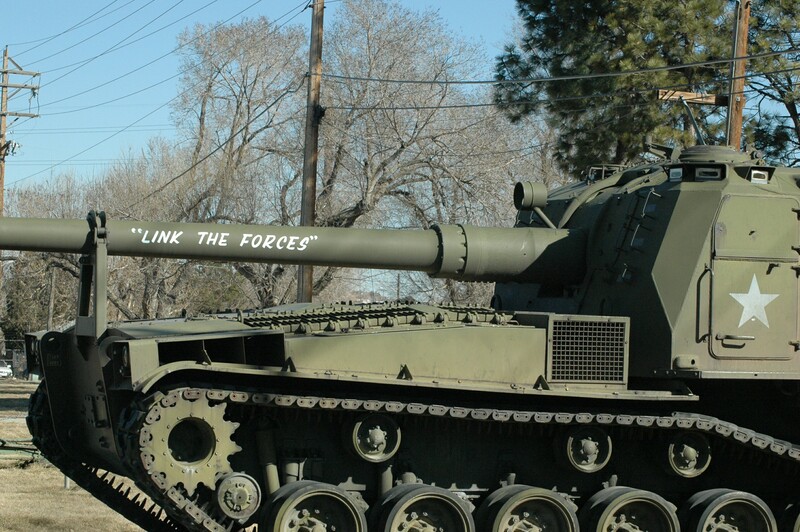 Enter Cherry Creek State Park and make choices about returning to where you start. 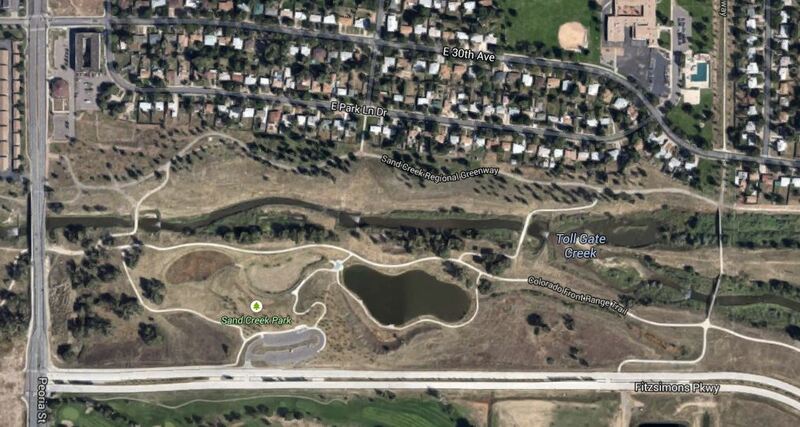 Turn right for the direct route (along the Cherry Creek Trail) or left to circle the park or explore points beyond. 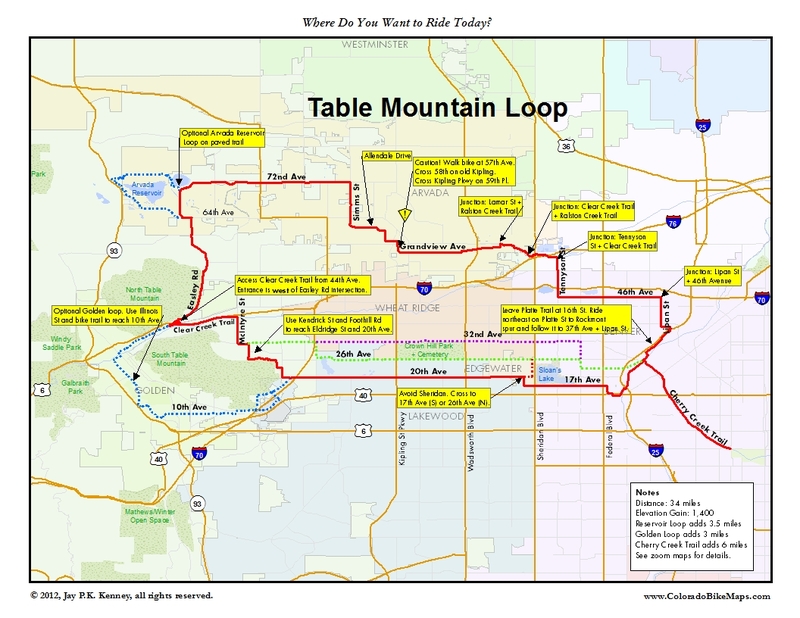 If you ride this in reverse order, the only caution is the turn from Fitzsimmons Parkway onto Peoria St to reach 25th Ave. It is uphill, there are only two lanes, and there can be high traffic intensity during rush hours. It is a short tenth of a mile but if you are feeling beleaguered, there’s a narrow sidewalk you can use. The Sunnyside neighborhood is one of the four neighborhoods that collectively make up the area that most refer to generically as “The Highlands.” The others are Highland, West Highland, and Berkeley. 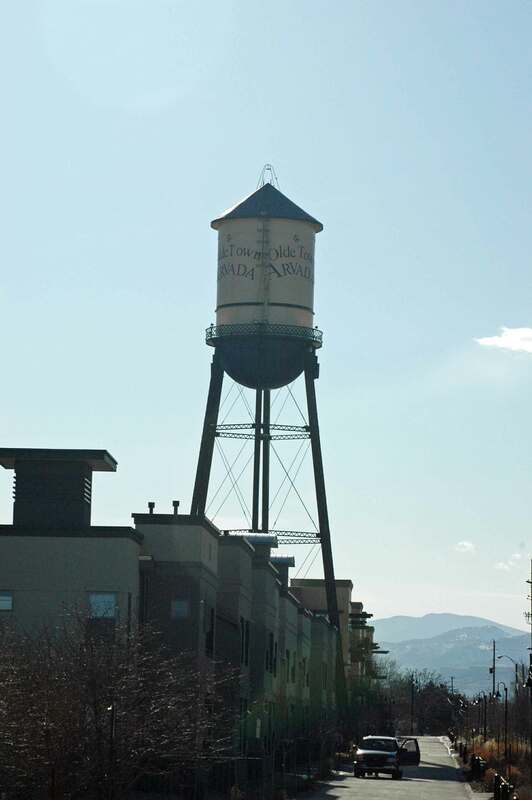 Bounded by Federal Blvd, 38th Ave, I-25 and I-70, Sunnyside has yet to be overrun by hipsters, espresso shops, and micro-breweries. It took me a while to figure out how to get easily to 46th Ave, which ranks in my personal top ten as one of the best east-west streets in Denver, right up there with Dartmouth Ave, Montview Blvd, and 26th Ave. (Aside: have you ever noticed that there are far more great east-west streets in metro Denver than north-south?) Then I discovered a short piece of trail near an abandoned factory out past Cuernavaca Park that provided the missing link and avoided a scary underpass on 38th Ave and multiple twists and turns along Central Ave. 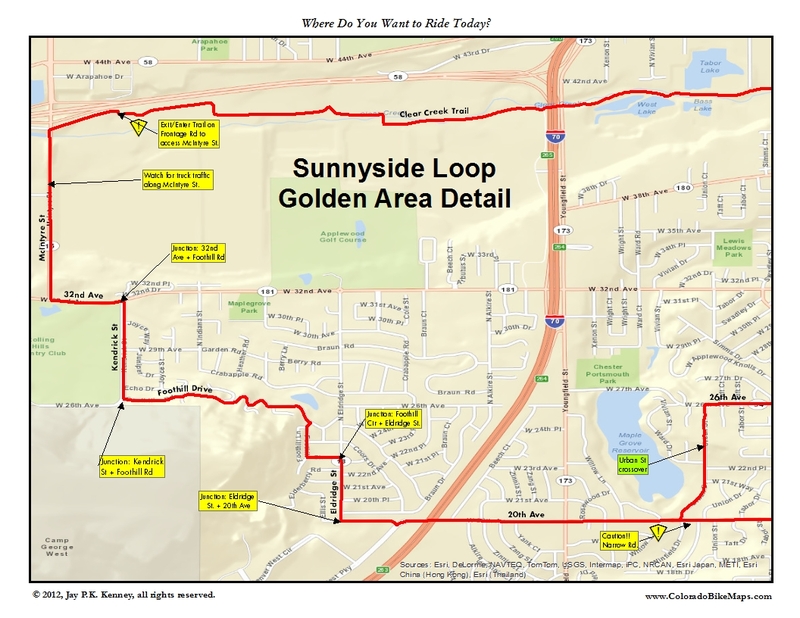 The Sunnyside Loop takes in a good chunk of 46th Ave, the Cottonwoods section of Clear Creek Trail, a short stretch of residential climbing hear the Rolling Rock Golf Course, and returns along 20th Ave. You can ride it in either direction. 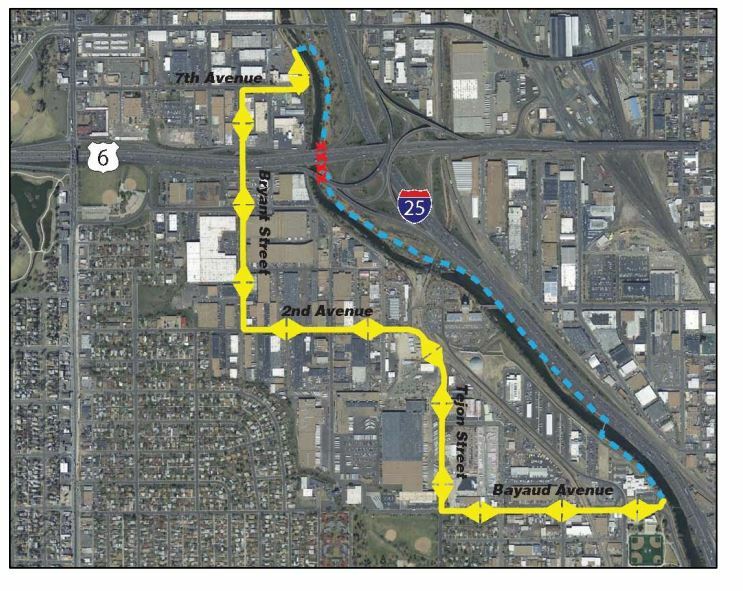 I like going west on 26th Ave and east on 20th Ave, but everyone has a different idea on which is better.The description below starts at Confluence Park and goes counter-clockwise. Start at Confluence Park. 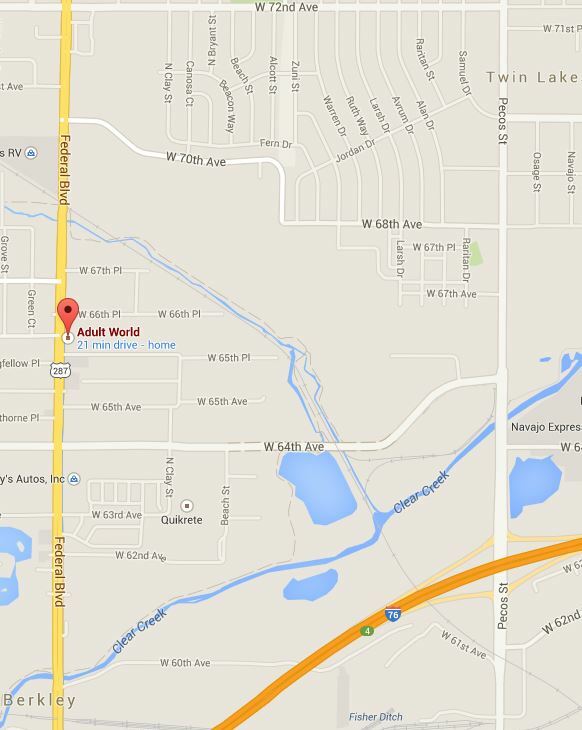 Get out to Platte St by leaving the Platte Trail at 15th, 16th, or 19th Streets. 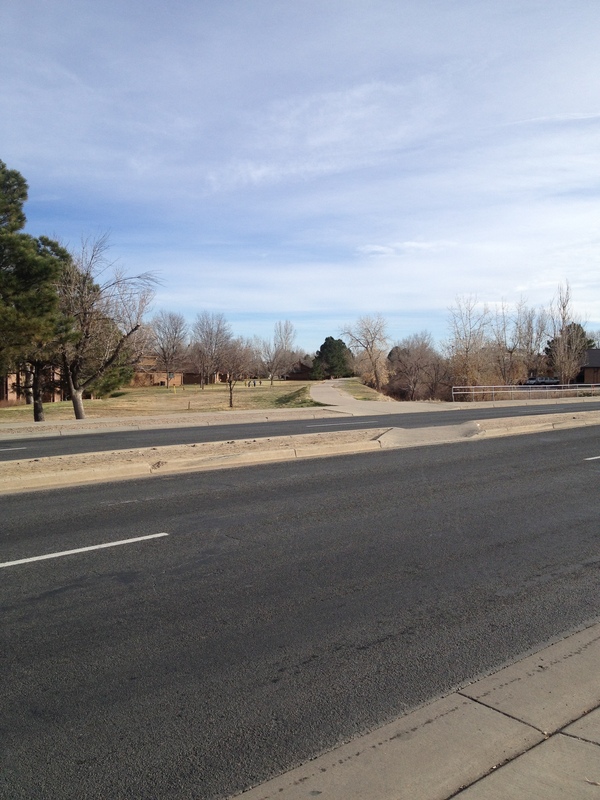 Ride north on Platte St to where it dead ends in a circle at Cuernavaca Park. This last stretch of road is called Rockmont Drive and honors the now defunct Rockmont Envelope Company that still graces the site, awaiting the right developer and a recovering economy for further direction. 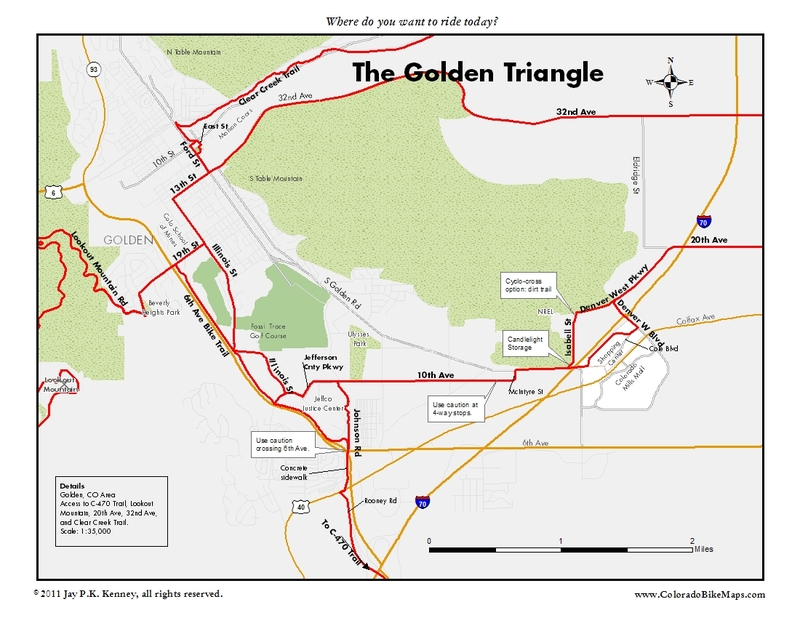 Ride north on the trail spur to connect to 37th Ave and Inca St. 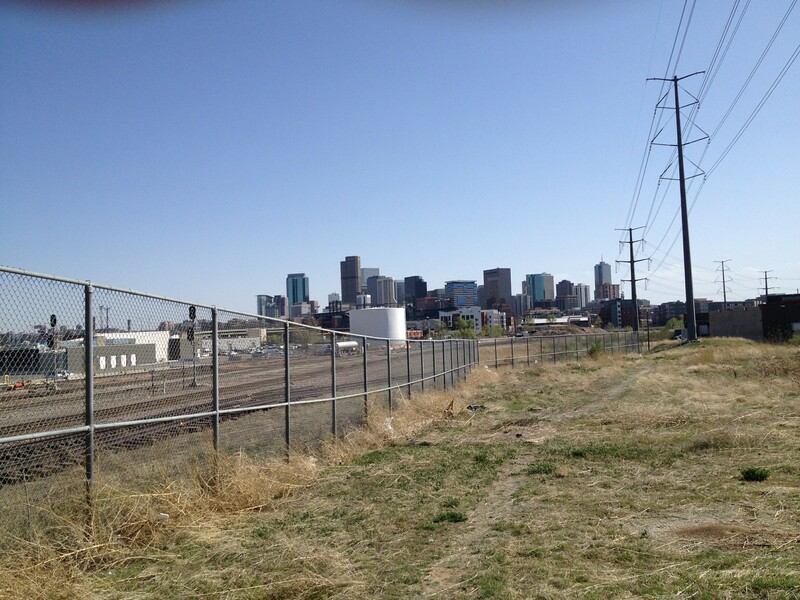 Some good graffiti and an interesting view of Denver will greet you. 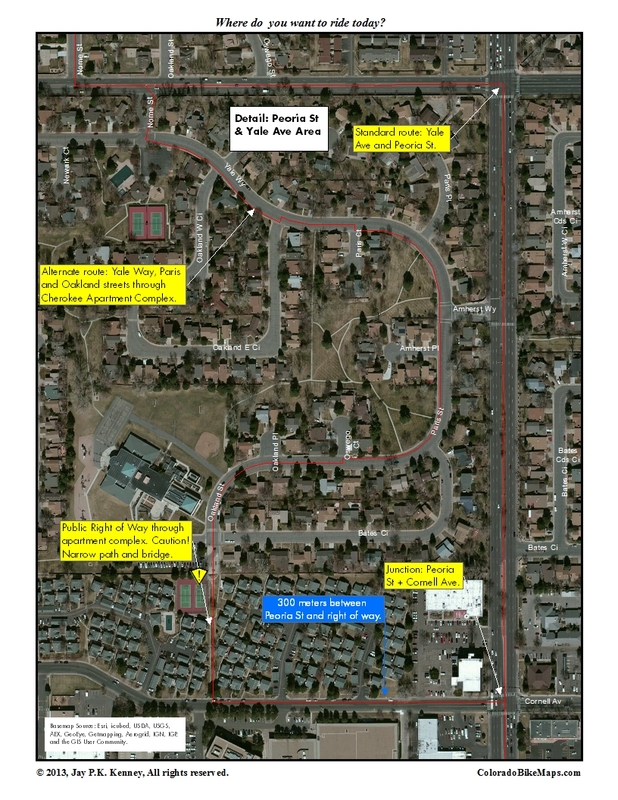 Snake your way along Inca St and 37th ave to reach Lipan St and cross 38th Ave to reach 46th Ave. Ride west on 46th Ave to Tennyson St then go north (right) past Willis Case Golf Course to 52nd Ave, the northern boundary of Denver proper. 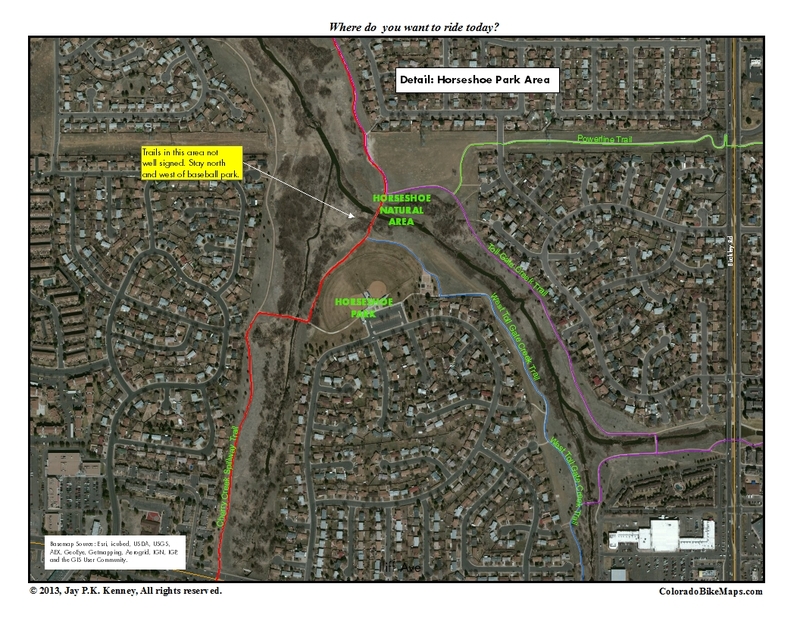 Jog right and left to stay on Tennyson and descend a fast hill to intersect the Clear Creek Trail. It is not well marked but look for the pedestrian crossing sign and stop if you see the water in the creek. East of here Clear Creek Trail is pretty industrial, but the stretch between Tennyson and McIntyre streets is more natural with good shade on hot days and interesting parks and bridges to hold your interest. 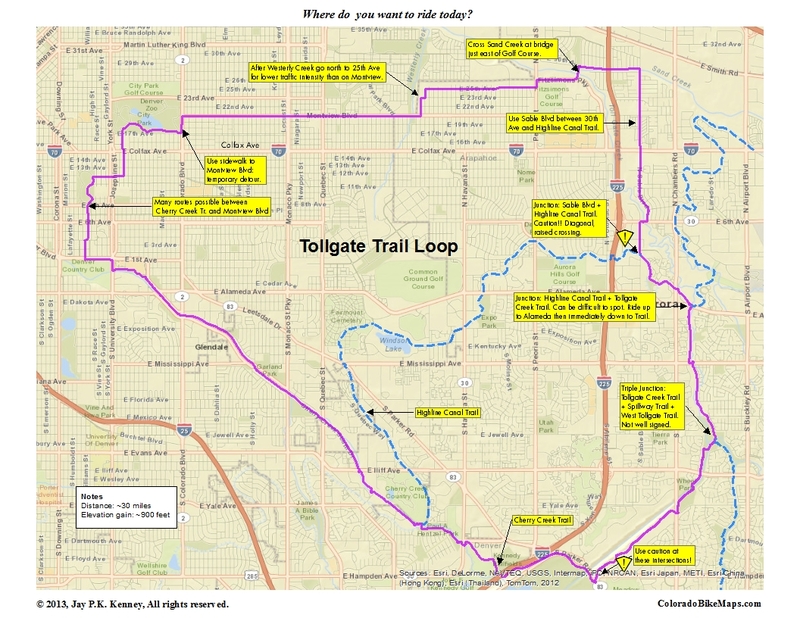 Route finding is generally easy–look for the Clear Creek Trail signs and follow them. Sometimes around the many parks along the way there are two possible routes–just follow the trail of least resistance and you’ll be fine. if there’s been a lot of rain, avoid the underpasses along the major roads. Don’t be stupid or careless. If you are caught in a downpour and Clear Creek floods, move to higher ground–don’t seek shelter in one of the underpasses. 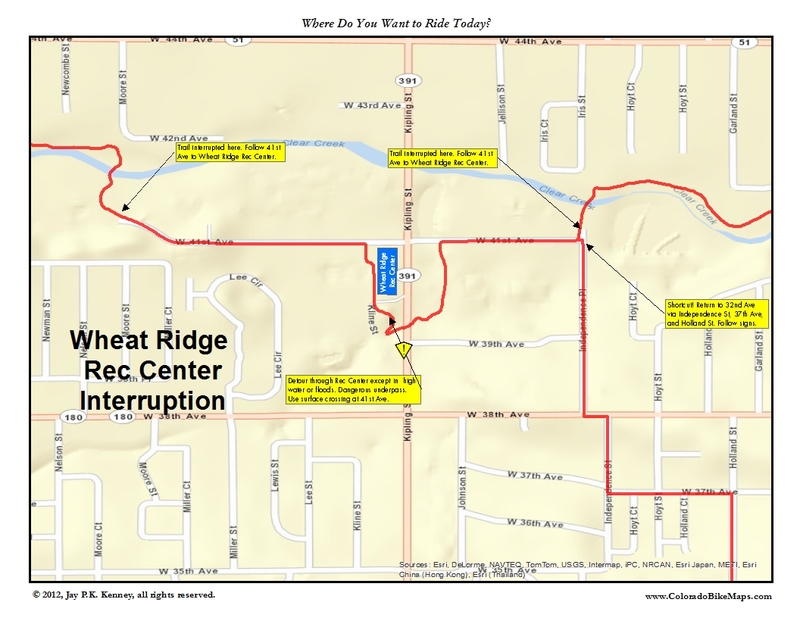 The trail is interrupted twice, once at 52nd Ave and once again near Kipling St and the Wheatridge Recreation Center. The first interruption takes you briefly along quiet city streets. The second detours under Kipling and through the Rec Center parking lot. 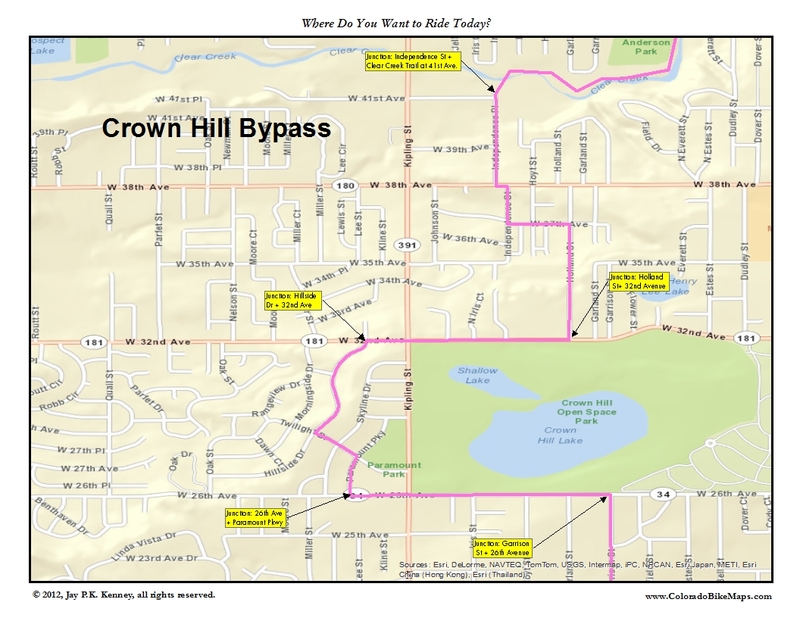 If the Kipling underpass is flooded (it collects water easily) cross (without a light) at 41st Ave or at Kline St (with a light–just south of the Rec Center). Watch for two sharp sequential humps along the trail, ridges really, that could throw the unwary cyclist. 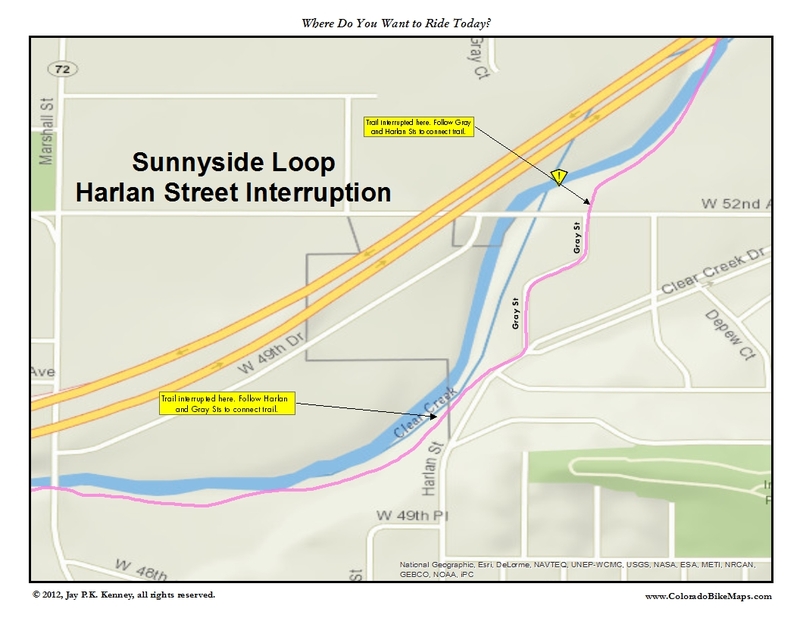 You can also shorten this loop by exiting the trail just before Kipling St at Independence St and riding south to connect to 32nd Ave. Surprisingly, all you need to do is follow the signs. Exit the trail at McIntyre St by leaving the trail before Mcintyre and ride west on the Frontage Rd to make the turn on McIntyre. How will you know? Look for this building on your left. And if you pass under McIntyre by mistake, don’t worry. Just reverse course on the ramp and enter McIntyre from the west side–it is just an awkward maneuver and the exit from the Frontage Rd makes it simple and seamless. Ride south on McIntyre to 32nd Ave. Go east (left) a short distance to Kendrick St (look for the sign for the Rolling Hills Golf Course) and escape 32nd Ave by riding south (right) on Kendrick to Fooothills Rd. 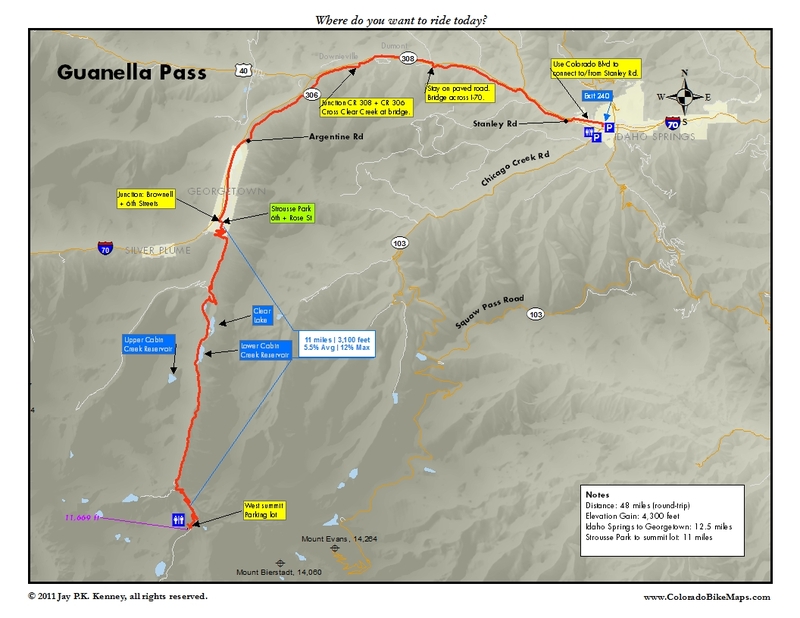 Turn east (left) on Foothills. 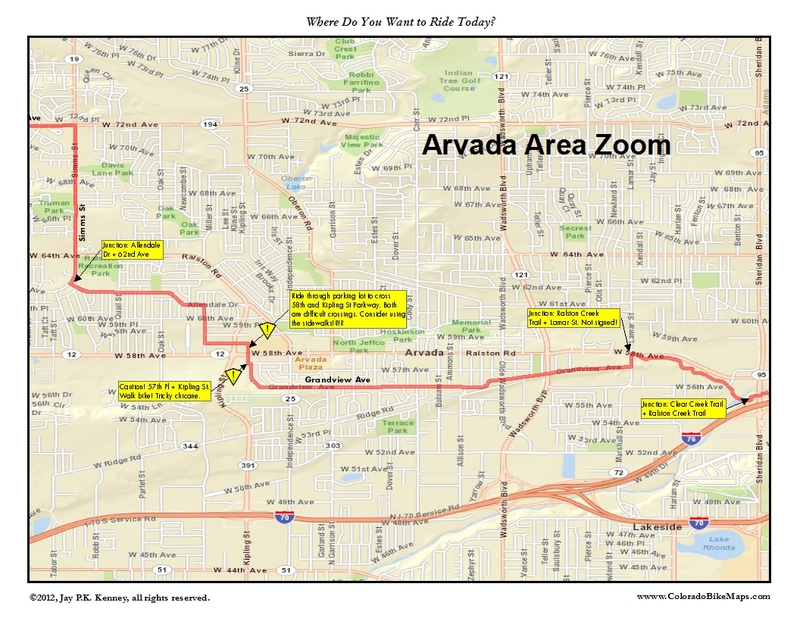 Climb through a small residential area and work your way east to Eldridge St. Go south (right) to join 20th Ave.
2oth Avenue is a great route east back into Denver. 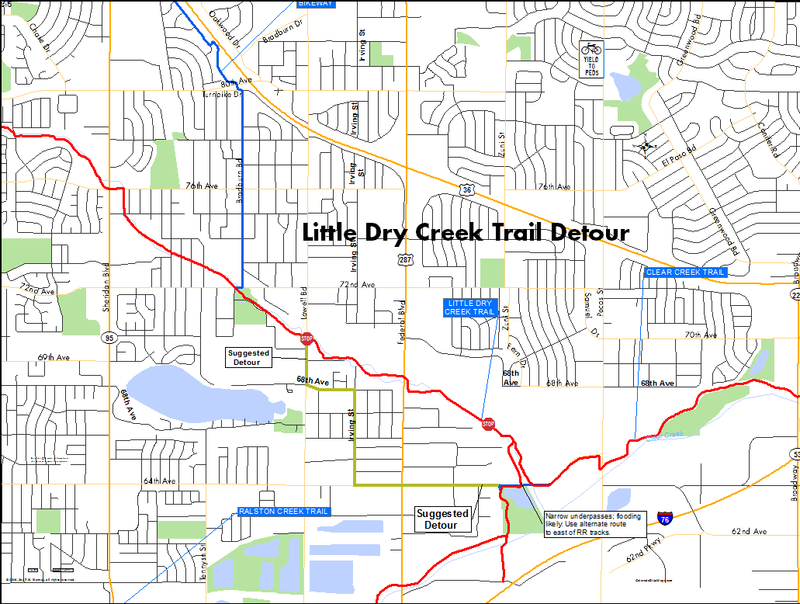 Watch out for a narrow area through Lena Gulch (where the Maple Grove Reservoir starts). 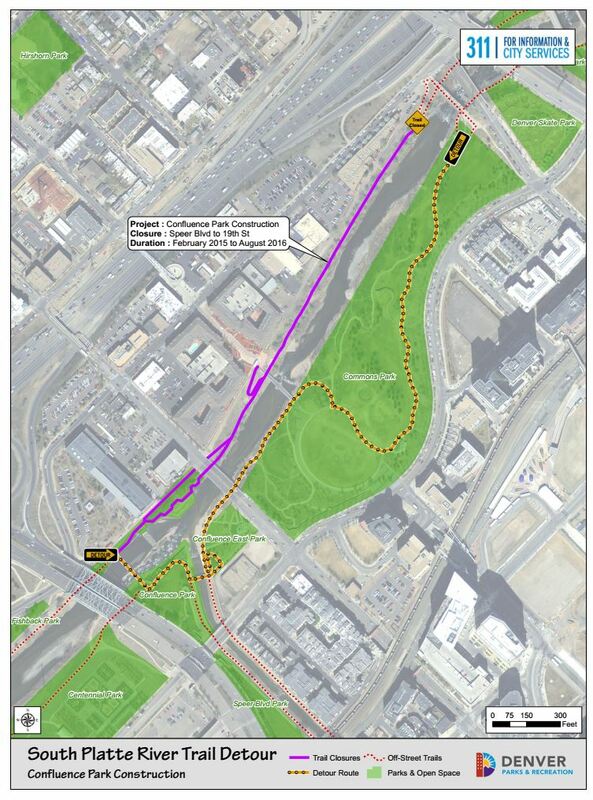 Otherwise, there is a striped bike lane for most of the return. 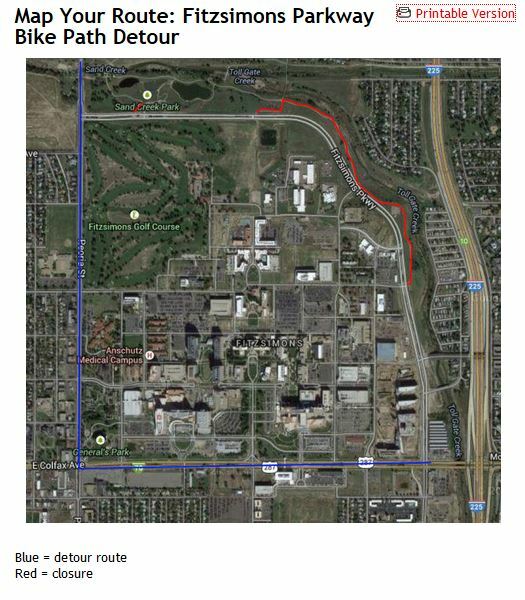 Just before Sheridan Blvd, detour around Sloan’s Lake at Depew St. Ride south t0 17th Ave, then east again to Sports Authority Mile High Stadium. You’re almost home. 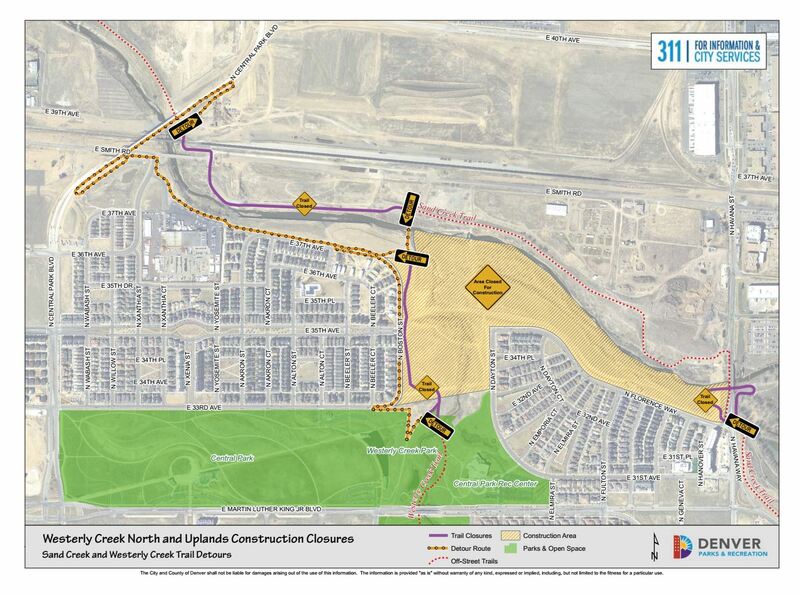 Circle the sports complex to the north or south and rejoin the Platte Trail just east of the Stadium. 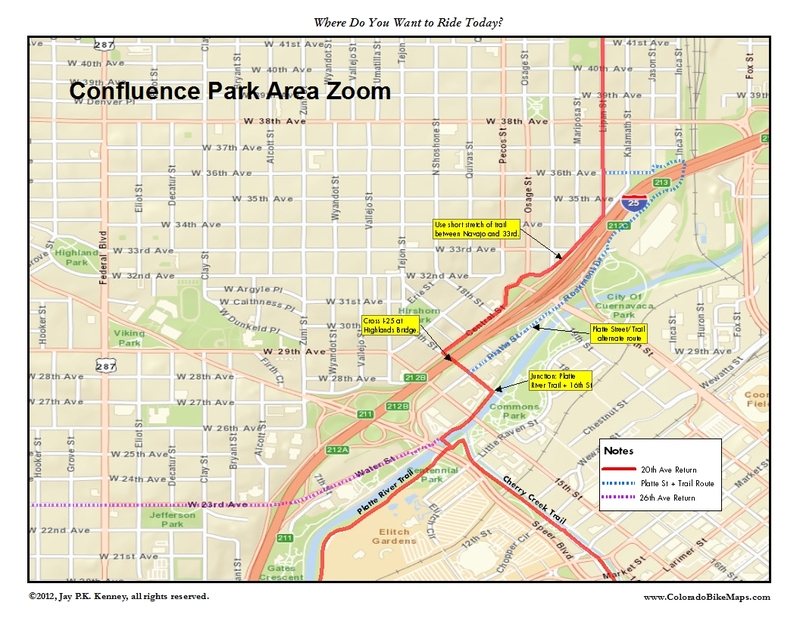 Ride the trail north (left) back to Confluence Park. 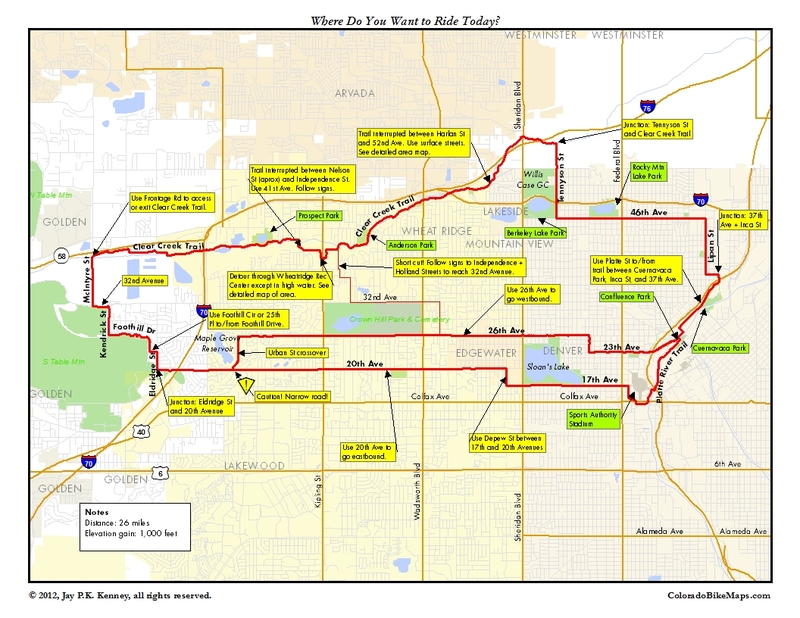 This is one of the many supplemental maps found in Great Road Rides Denver. All are designed to help you navigate safely and precisely through some of the thornier parts of the metro region, such as the Dartmouth Dodge. 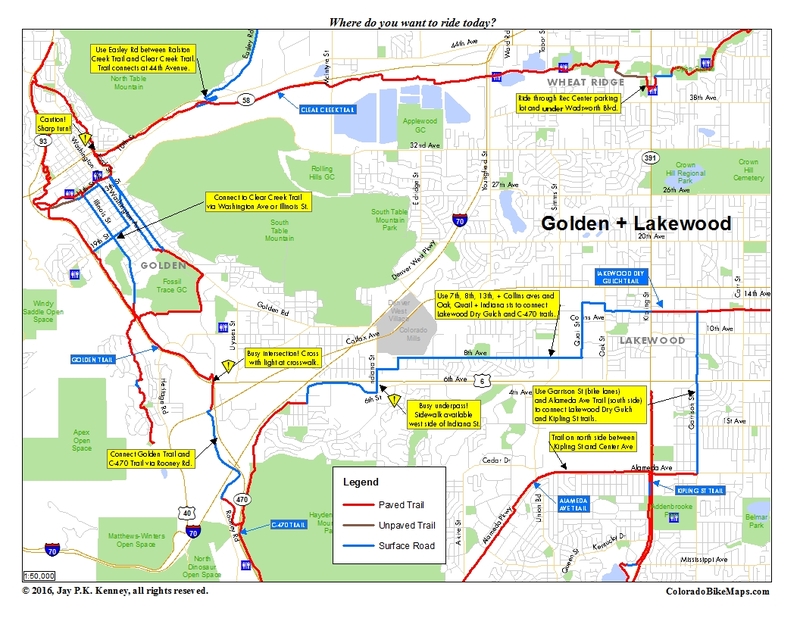 Shown here are the major links to get you in and around Golden, including links to the Clear Creek Trail, the C-470 Trail, and Beverly Heights Park in Golden (from which you access Lookout Mountain and the Genesee Mountain Loop). 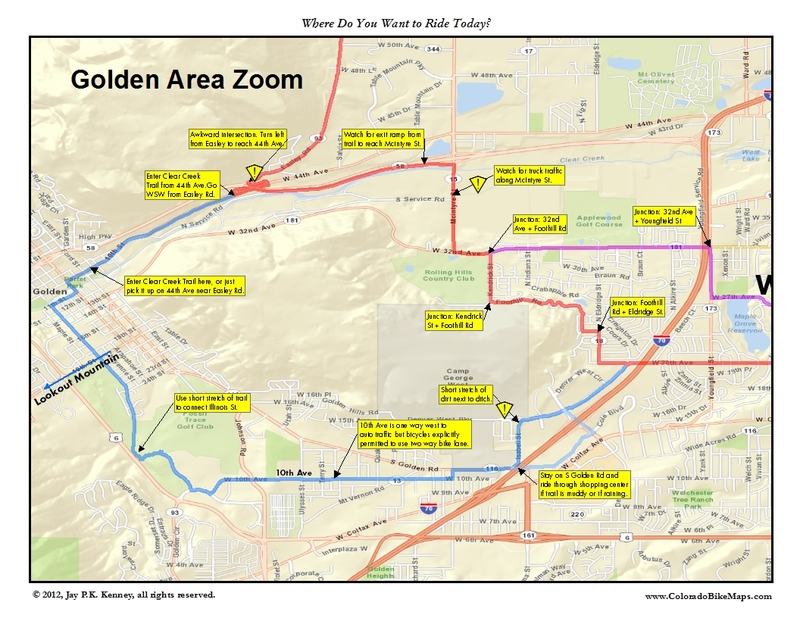 Most of this is self-explanatory but a two areas warrant some detail: the start of the Clear Creek Trail, and skirting South Table Mountain to reach Illinois St, the Golden Trail, or Rooney Rd and the C-470 Trail. 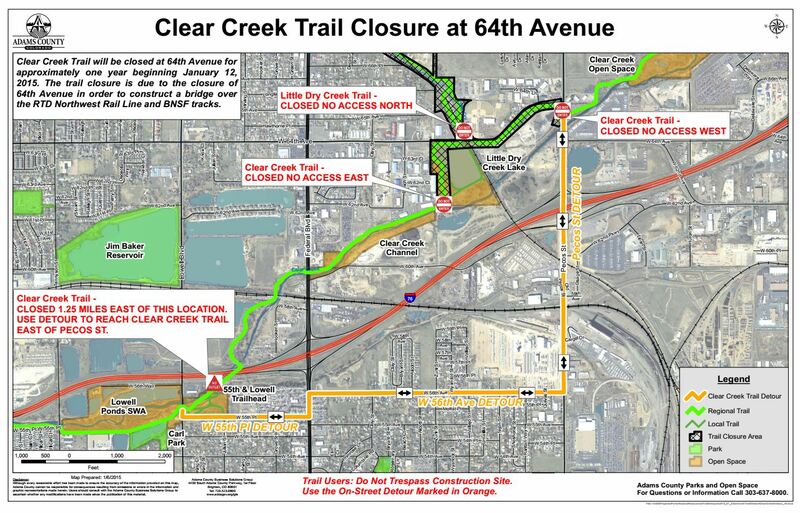 For Clear Creek Trail, ride east 1/2 block from the intersection of 10th and Ford. 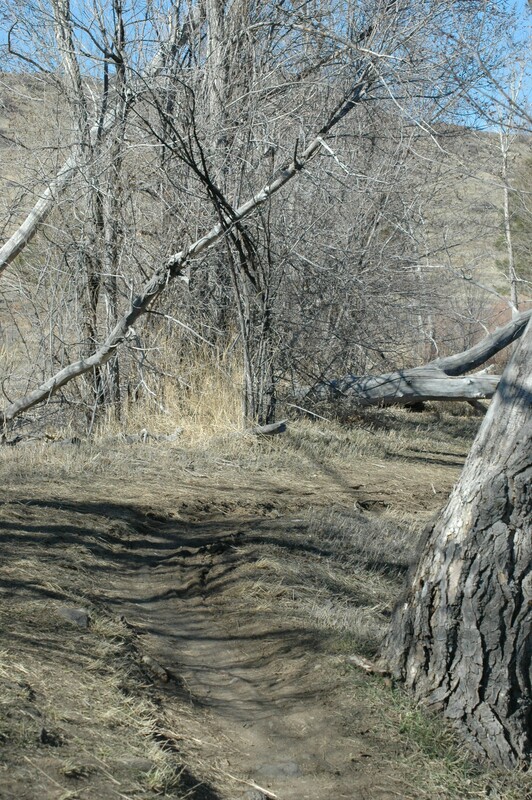 Just after you pass over a nasty looking, concrete drainage ditch, the trail breaks off sharply to the left (north). Another equally sharp, diagonal turn (to the right and east after two blocks) will put you safely on the trail. 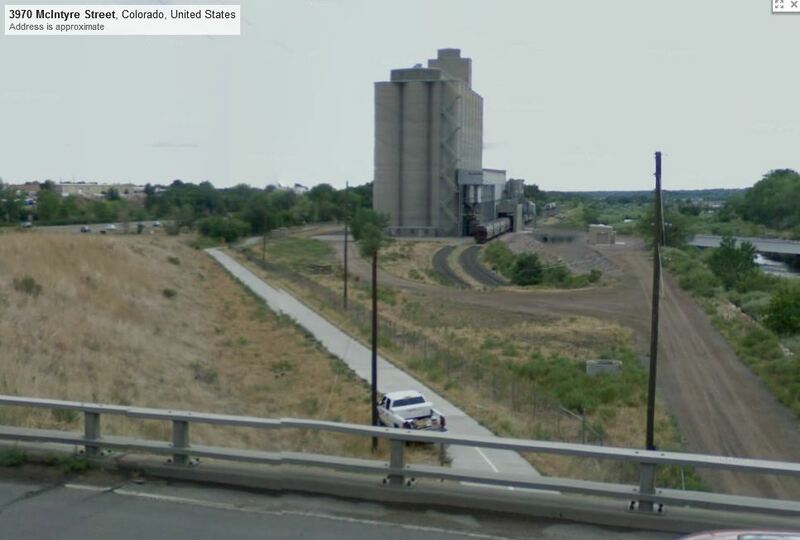 If you are coming from Red Rocks and Rooney Rd, make a right on Colfax Ave at the traffic light, then look immediately to the left for a concrete trail that sits in the western shadow of the C-470 overpass. 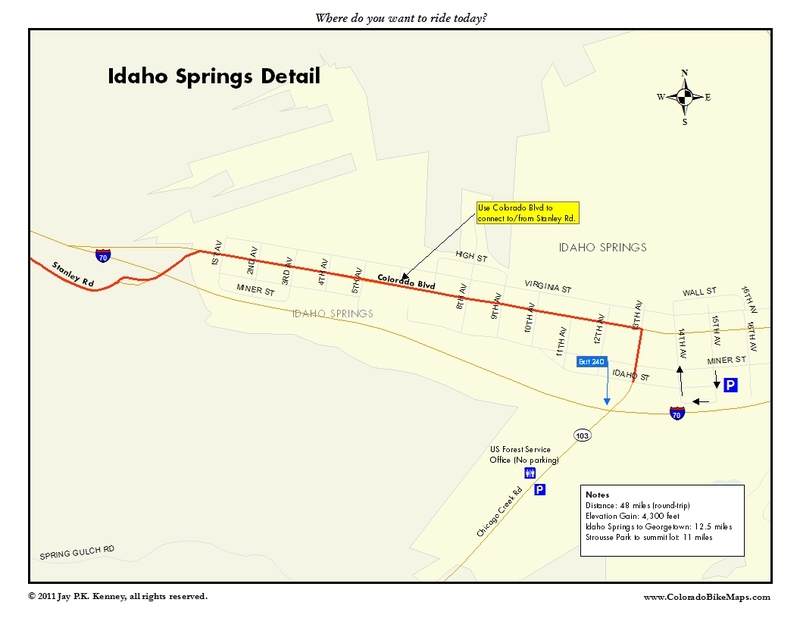 Grab the trail to the intersection with 6th Ave. Go north on Johnson Rd, right on 10th Ave and follow 10th Ave all the way to McIntyre St. After Ulysses, you’ll be riding (legally) against traffic in a designated bike lane. 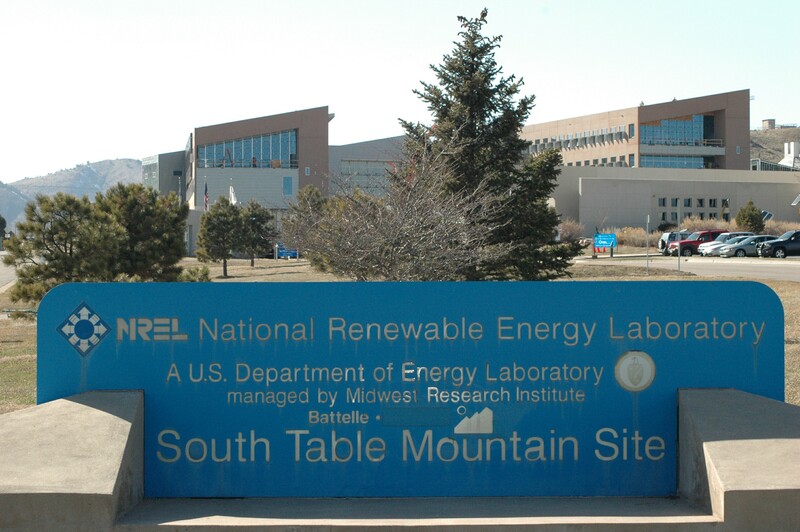 and pop up going east on Denver West Pkwy just outside NREL.